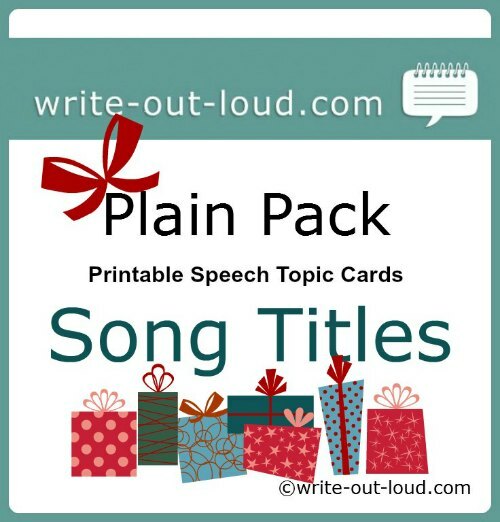 [Speaking-Out-Loud December 2015] Open for a fun Christmas give-away to share. So the house is bulging with assorted guests - friends, family, neighbors, and maybe in your part of the world the weather is less than festive but the show must go on, indoors. How about playing some speaking games? These are good old-fashioned fun and suitable for any age group. To help you get from thinking about the possibility of playing some games to actually doing it I've included a vital step - some cards to play them with. They're in a downloadable pdf. To get them just click on the link - Song Titles. There are 100 song titles here ready to be used as prompts for at least 3 games - actually 5, if count variations on a theme. Once you've got going I'm sure you'll think of more. You'll also need a timer. This game has everyone speaking for one minute on the song title they select. The initial goal is to survive the minute. You can add layers of difficulty or skill if you wish. The full details are on my website with two extension variations. Click One minute speeches to take you there. I promise you that once people have loosened up a little it will turn into loud, laughing, raucous fun. The same set of cards can be used for this one. Each person selects a song title that must be woven into the last sentence they say in their one minute speech. It doesn't matter how they get there! Encourage imagination, out-and-out fantasy, extraordinary tall tales - anything and everything (bar offending the company you are in) is permissible! Now use those ultra-flexible song titles as starters. What spell-binding stories can be woven around a beginning like "Paint it black"? Or how about "Are you lonesome tonight?" Be sure to award prizes for the best use of imagination, the longest dramatic pause, the best off topic segue and so on! For more verbal hi-jinx and silly speaking nonsense, that incidentally delivers major public speaking benefits in the guise of fun, check out public speaking activities - 5 fun speech exercises. Yes? I am offering two FREE advertising slots available to organizations, not-for-profits ... who use their expertise, and skills to empower others. For more see Sponsorship Advertising. Please do get in touch. I'm looking forward to sharing the positivity that you have to offer. This is becoming a bit of an annual tradition! In my 2014 Christmas newsletter I referenced my 2013 newsletter on the joys of reading aloud. I said in 2014, "it was still top of my giving list." One year later nothing has changed. Connecting through story telling or reading aloud is a timeless gift. If you click those newsletter links you'll find a treasure trove of stories to share across all age groups. Magical! Just the thing for bringing an evening of full-on activities to a heart-warming close.